My name is Justin Sirois and I am a published novelist and game maker. I teach kids how to create roleplaying games (RPGs) and build worlds through the Bright StARTs program. I have also taught at the Baltimore Museum of Art and lectured at the The Maryland Institute College of Art, Art Institute of Charleston, and Poly Prep in Brooklyn, NY. What makes my teaching different? I not only teach young people how to play roleplaying games, I teach them how to create compelling interactive narratives. This dynamic outlining skill translates to other genres of creative writing like short stories, novels, screenplays, and video games. I teach young people to tackle large projects and issues one scene/chapter/act at a time. I show them how to craft meaningful tension that can be maintained over hours of play or reading. And I show them that creativity, in any discipline, will help them develop a uniquely marketable voice that will bring happiness to themselves and their community. What happened to graphic novels (comic books) in the 2000s is happening to roleplaying games. This alternative way of telling a story is gaining respect by art critiques and academics as people realize that the craft isn't just about fantasy -- it's about opening yourself to deep, interactive storytelling. From Joe Manganiello to Deborah Ann Woll, the American-born art of tabletop roleplaying is experiencing a renaissance. I am available for author appearances, lectures, and workshops for all ages. You can contact me at justinedwardsirois at gmail dot com. 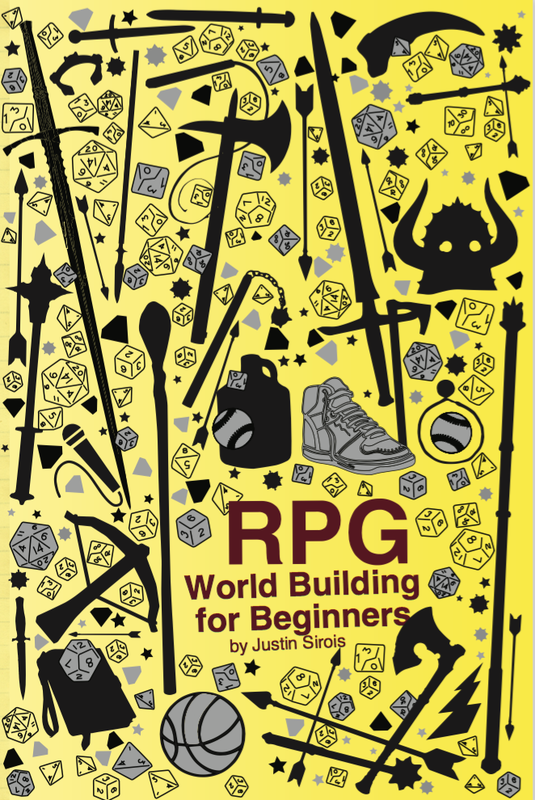 RPG World Building for Beginners is a guide for new players that want to create their own RPG game and/or story (module). 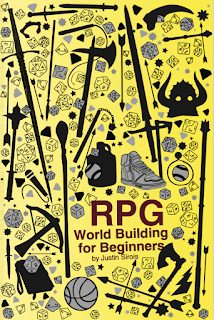 With illustrations, example adventures, glossaries, and simple to understand instructions, Justin Sirois tells you how to run a tabletop game, create compelling characters, and a relatable plot. This book is focused on fantasy, but it can be adapted to any genre. The book uses a system called D-Low which only uses 3 six-sided dice. All you will need to write and play are commonly found dice, a pencil, and paper. And, like any good writer, a big eraser. This book will be released in November 2017. Many famous writers and directors began their relationship with creative writing through roleplaying. Roleplaying games (RPGs) foster creating writing, problem solving, cooperation, public speaking, community, math, and spacial reasoning. And one of the best things about RPGs is that kids have fun doing it. Justin Sirois is a novelist and game maker living in Baltimore, Maryland. His books include MLKNG SCKLS (Publishing Genius, 2009), and Falcons on the Floor (Publishing Genius, 2012) written with Iraqi refugee Haneen Alshujairy, The Heads (Newlights Press 2013), as well as So Say the Waiters books 1, 2, and 3 (2012, 2013, 2014), The Last Book of Baghdad (Civil Coping Mechanisms 2016), and the novel series Two Girls (Amazon's Kindle Press). He founded Narrow House, an indie publishing company, that ran for ten years. He owns and operates Severed Books, a fiction and game publisher, titles including Dungeon Dealer and the series Beneath. Here is an outstanding piece in the New Yorker about the resurgence of Dungeons and Dragons in popular culture.